Durga Patva hails from Farrukhabad, Distt. UP, India. Having done her M. Phil. 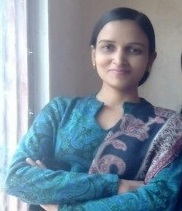 from CSJM university Kanpur, she is now Persuing a Ph D from Lucknow University. She is fond of writing poems and short stories. Her poems and articles have been published in various national and international magazines and anthologies like: “A DIVINE MADNESS: AN ANTHOLOGY OF MODERN LOVE POETRY VOLUME 3” (Published by ARDUS PUBLICATIONS Courtenay, British Columbia, Canada), Reflection Mag, Whispering Winds, I Am A Woman, Indifaring Muse and so on. Her poems are also available on several literary websites like boloji.com and poemhunter.com.